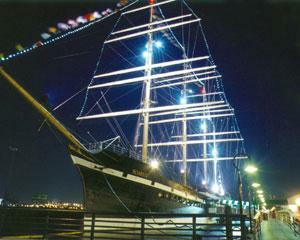 When the developers of the Moshulu, a 4 masted sailing ship turned into a commercial restaurant docked on the Delaware River in Old City Philadelphila needed an electrical contractor they came to Academy for all electrical design, engineering and complete installation of electrical systems for a fully functioning restaurant. Mr. Marinari was asked to personally design and engineer all of the exterior lighting for the ship to include, mast lighting, up lighting for rigging and outline for sails. Over the past 20 years a picture of the Moshulu "Lit Up" has been used extensively in their ad campaigns throughout the country. If you have an electrical project that requires special attention, contact Academy Electric. Academy Electric was incorporated in 1986 as a family owned business. Today Academy is at the forefront of the electrical contracting industry, and is one of the Delaware Valley's oldest and largest merit shop electrical contractors. With more than 30 employees, a comprehensive supply of parts and equipment and a fleet of service vehicles, Academy is the preferred electrical contractor of choice for all of your electrical needs. Academy Electric is located in Winslow Township, Camden County, New Jersey, and we are available to serve you on projects within the Tri-State area. Academy Electric is fully licensed by the City of Philadelphia and the States of New Jersey and Delaware.